The Cigarette Helps Relieve Stress? Wrong! “When I’m stressed, I smoke a little cigarette, and it relaxes me. This is why I will not quit smoking. I would be afraid of being too anxious.” In fact, tobacco is a fake anti-stress. It’s tobacco that makes anxiety! Cigarette smoking is a fake anti-stress! It was long thought that the more stressed people tended to smoke to relax. We now know that this is false. The risk of anxiety disorders is increased in smokers. The risk of generalized anxiety is multiplied by 5.5 (increased by 550%) and the risk of panic disorder by 15 (up 1,500%). Overall, this is the cigarette is making people anxious and the phenomenon of missing calmed by taking nicotine gives the impression that smoking relaxes . It’s a trap! If you already know that it is tobacco that increases your stress, you do not see more in the same way. Start by identifying why you smoke in times of stress. Systematically looking for alternative to a cigarette can be difficult but this is the only way to get rid of smoking or understand the facts. Find another way to relax a bit, tobacco will not help you! Smoking is to destroy something – It may be your lungs, kidneys or the nerves. Why don’t you destroy something else like destroy a paper clip, knead the bread, chew and spit some chewing gum or the cigarette itself? Smoking is sometimes fighting against loneliness – So call a friend instead of taking your cigarette. You will feel less alone and it will be more suitable. Smoking is to calm down – Listen to a soft music, a relaxing session of 2 or 3 minutes or look for what works for you personally. Helen goes to brush her teeth, when she wants to smoke. It gives her breath better than a cigarette! She does it at least 4 times a day and it allowed her to decline the smoking frequency. To be less anxious or anxious, stop smoking! Ex-smokers are less anxious than smokers. So, if you stop, you will feel the benefits quickly. And so much more that you learn to know your anxiety and find other solutions before they quit smoking. 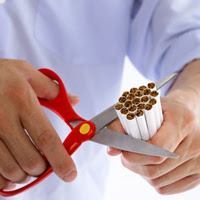 Get help by free consultations by phone from tobacco specialists. And then, four weeks after stopping smoking, the anxiety scores of former smokers decreases. Do you also know that smoking can make depression? Anxiety, depression also! – It is observed that high dose of nicotine in heavy smoker increases the risk of depression. During smoking cessation, the depression diminishes. The risk of suicide is also higher among smokers. There is two times more suicide in smokers under 25 cigarettes per day and 4 times more for smokers over 25 cigarettes per day. If you stop smoking, the depression score decreased from 3 weeks and 3 months, the score drops considerably. So what do you expect to motivate you to stop smoking? Unlock your power to quit smoking now! Read Stop Smoking for the Last Time: You Can Unlock the Power to Quit Struggle-Free by George Wissing to learn how. He writes for a health reviews site where people can read and share hospitals reviews, doctor reviews and other medical facilities based on their experiences.